The Scovill Model 47130VB is customized to be a perfect fit/direct replacement for the fill valves in certain American Standard* one-piece toilets. 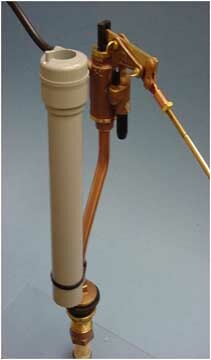 The refill tube is positioned toward the unique overflow tube of these tanks. Packed with brass float rods to fit each American Standard* toilet. Packed individually and available in cartons of 10. Installed height 9-1/4".